We have spent 7 years looking for our dream house and location, now that we have found it we want to offer you in Polfages the chance to enjoy the best standards found in English country cottages with the life style that can only be found in the South of France. With a location we fell in love with it really is one of the most relaxing and beautiful places we have ever seen. Polfages is an idyllic location for your holiday. 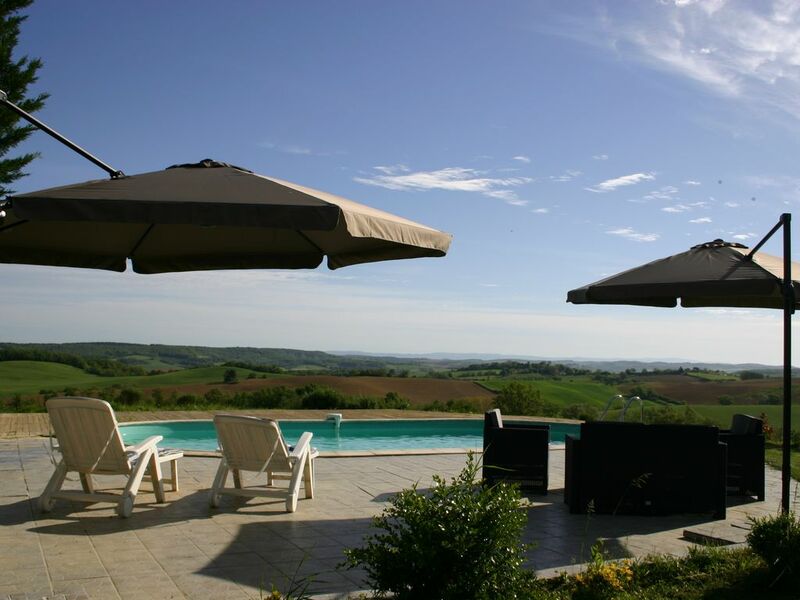 Situated over looking rolling hills with views over to the Montagne Noir on one side and the Pyrenees on the other. It offers a holiday that can be both relaxing and action packed. Polfages is ideal if you just want to sit by the pool and relax taking in the stunning views or if you want to make the most of you time in the region. With the beach just over an hour away and the mountains the same you can truly get the best of both types of holiday. Mazamet is made up of an open plan 1st floor with a well equipped kitchen and dinning area and a comfortable lounge area. The lounge leads onto the terrace and BBQ area, where you can live the alfresco life style whilst relaxing with the stunning views. You can access the garden and pool from the terrace. The second floor consists of 3 very large twin or double bed rooms. Each bed room has an en suite bathroom. All the bed rooms are designed to the highest standard of comfort and with the extra space in each bedroom they are all both light and airy. There is access to WIFI and English TV channels so you can stay in touch with the world should you so desire. It is possible to rent Mazamet and our other gite's Belcaire and Calmont for those bigger parties, allowing up to 14 people to holiday together, whilst allowing guests the ability to have time to them selves at the end of the day in separate gites. Please visit Owner Direct (also owned by 'HomeAway) by clicking this link https://www.ownersdirect.co.uk/accommodation/p8139627 to see our guests views of their stays with us. We have spent 20 years helping to running holiday cottages in the UK and holidaying in gites in France. We want to offer you in Polfages the chance to enjoy the best standards found in English country cottages with the life style that can only be found in the South of France. With a location we fell in love with, it really is one of the most relaxing and beautiful places we have ever seen. Polfages is somewhere that my family and I think of as truly special. Every time I walk the dogs or just sitting and take in the views I realizes how luck we are. From the views that stretch away into the forever distance to the clean pure air that comes from the stunning Pyrenees. Taking the in the silence of the country side to watching the hawks spiraling upwards into the clear blue sky. Polfages really is where the Mountains meet the Sea and there is a world of things to do in between to suit everyone. At Polfages you really are able to have the best of all worlds. From sitting by the pool relaxing with stunning views and tranquility while recharging your batteries to being able to visit some of the most historic sites, towns and castles in all of France. Learn about the history of the Cathar's and how the Canal de Midi was built joining the Atlantic to the Mediterranean. If you would like to include mountains activities in your holiday then the Pyrenees are only 45 minutes away, or in just over an hour you can spend time on the Mediterranean beaches. Notes on accommodation: PolfagesAll three of our gites have been fully refitted and updated this year to give our guests the best of the old and new. We have tried to keep the best of our over one hundred year old farm whilst trying to make sure that everything you would want for a perfect holiday is also available. Because of our location, set on a hill within 5 acres of land you will always be able to find somewhere to enjoy the views and tranquility if you want Outside: The pool is set in the gardens of Polfages, over looking the stunning country side of the region and giving you a truly panoramic view. Guests from both gites have access to it. The perfect way to relax at the end of the day of get away from the heat of the summer.